: When I was 3 years old , My Mother said I tipped over a microphone at the intermission of a school-play , & started screaming " HOUND-DOG " , so....as long as I can remember. : The sound & control of His voice. "My Message to Elvis": 1st of all , I would thank Him for all the happiness He has brought to my life. After that , I would just like to get to know Him....I would prolly ask for a job , in order to do that. IF I had to ask a single question...It would be to ask Him , what were the most fulfilling things , that happened to Him during His life... and why. : They change every year or 2. His Christmas songs are fantastic , simply cuz His voice is louder than the music , you can get a real sense of the control he had...simply amazing! Songs like "it hurts me , suspicious minds , tomorrow never comes , reach out to Jesus " immediately come to mind. : I have a few , but I really like the "I got Lucky" album suit & all of them that he wore on "that's the way it is". : Most people would prolly name pricilla or Linda....But I think It's more basic than that...I would say His Mother & Music in general. : A friend called me , I was at my Grand-Ma's apmt & He said His Brother had heard it on a grocery-store radio. : His voice is phenomenal. It dont matter when it was made...It's the sound He had...good music will ALWAYS be good music! : No , I haven't. I've had plans to go , but something has always come up...I'm sure I will, though. :: I have never met the man , never shook His hand, but He has touched me in ways that I that I still dont understand. I see & think about Him everyday. His songs still touch me & when I am feeling down , He's always there....actually , He has prolly been THE most consistent thing in my entire life! How do you thank some1 for that?? : Thank you , but I dont need a special web-page. All the focus should be on the man who deserves it...ELVIS! : I admire anyone who strives to keep His memory alive. My Brother was a big "led-Zeppelin & Doors" fan & used to make fun of me...until He read some books on how Elvis had influenced THEM , & He came around ,lol. I dont think people realize how big an effect He had on SO MANY PEOPLE! I have read so much & have many great "unknown stories" of Him. If you ever want/need to hear some on your site , just let me know. As far as improving you site , Just keep gathering more info & pic's & movie-clips...etc. KEEP UP THE GOOD WORK! feel free to email me here----"bobtraskjr@yahoo.com"
Nice to hear from you. Thank you for sharing your comments memories & feelings on our survey. Elvis has touched so many leaving a deep love for him. He has had an everlasting affect on past & up coming generations. The strength in his voice goes straight to the soul! I love your message to Elvis. Very touching & true, words would never be enough for what he has offered to his fans`. He is soooo adored! 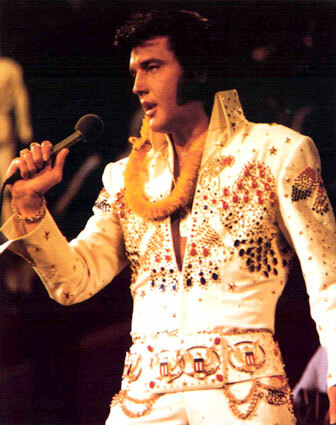 Elvis is a part of our daily lives & always will be` In our hearts Elvis Presley Forever! Bobby, below are the lyrics to one of your songs mentioned above. Enjoy!